On July 22, 2015, I reintroduced my resolution to impeach the Democrat Pennsylvania State Attorney General Kathleen Kane for a pattern of abuse and misbehavior in office. Then last week she was charged by the Montgomery County district attorney with obstructing administration of law or other governmental function, official oppression, criminal conspiracy, perjury, and false swearing.Earlier this year, Democrat Pennsylvania State Treasurer Rob McCord resigned from office and was charged with attempted extortion. He is now awaiting his sentence.No one should be above the law. Our new Democrat governor seems to also have a problem understanding that concept.Since taking office this year, Democrat Governor Tom Wolf has been taken to court for several of his actions that do not comply with the law or the Constitution. Regarding his removal of the Office of Open Records executive director, who had been appointed by the previous governor to a six-year term, the Commonwealth Court ruled that the governor had no legal authority to do so.The court also granted a preliminary injunction of Wolf’s attempt to use an executive order to unionize direct care workers. The Philadelphia district attorney has also petitioned the court over the governor’s moratorium on the death penalty. The Pennsylvania District Attorneys Association stated that, “a moratorium on the death penalty is a misuse of his power and ignores the law.”It should not be a surprise to anyone that a governor who acts as if he is above the law would express no concern about passing a balanced budget by the June 30 deadline. The Republican legislative majorities passed a balanced, NO tax increase budget and sent it to his desk by the deadline and he immediately vetoed it.The governor introduced his budget proposal in March and argued that it had to be adopted as presented with no changes from the Legislature. His proposal includes increases in the personal income tax, sales tax and tobacco tax. He also wants to create a new smokeless tobacco tax, a new cigar tax and a new, additional tax on natural gas extraction. In addition to increasing the sales tax, he proposes to expand it to include items and services that are not currently taxed. He wants Pennsylvanians to pay taxes on diapers, toothpaste, shampoo, soap, flags, aspirin, Tylenol, legal services, personal care services, waste collection, and even caskets! The list of items and services he wants to tax continues far beyond the ones I just listed. 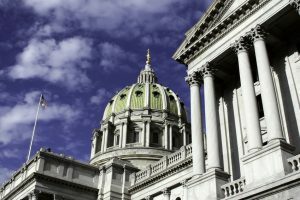 The governor has continued to demand his way, even though on June 1, 2015, the Pennsylvania House of Representatives unanimously voted down his tax increase proposal. Not one Democrat legislator voted for the tax increases he is demanding. The budget vetoed by the governor included 274 of 401 line item expenditures that were the same or greater than the governor’s budget. Instead of using his line item veto option on the lines he disagreed with, he vetoed the entire budget to create a crisis. Now he is trying to use the leverage of the budget crisis he created to increase taxes and take more from hard-working taxpayers. Most of the supporters of the governor’s budget whom I have heard from are teacher union members. The majority of people whom I have talked to have not noticed a difference in their daily life because the state budget is seven weeks late. If the governor gets his way, all Pennsylvanians will notice an impact on their daily life due to the $4.7 billion tax increase he is demanding. If the governor’s budget crisis is affecting your daily life, then I invite you to email me to share how. If you are in the majority who would be impacted by Wolf’s tax increase, then I invite you to sign the NO Tax Increase Petition at RepMetcalfe.com. I will continue my fight to protect taxpayers!